Whether you’re after stocking fillers for teenage students, a Secret Santa present for an office colleague or something special for a full-time writer, you can find loads of gorgeous gift ideas for writers, readers and literature fans online. 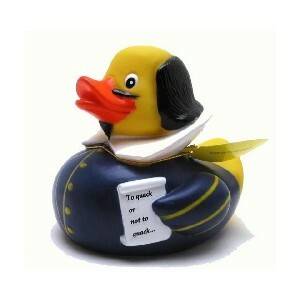 It might be a bit kitsch, but this Shakespeare rubber duck is guaranteed to put a smile on any budding writer’s face – whether they keep it in the bathroom or put it on their desk. Most writers rely on a regular injection of caffeine to keep their creative juices flowing. 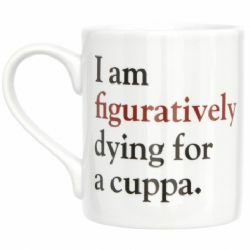 This Grammar Grumble mug is therefore the perfect present for anyone who cringes at the frequent misuse of the word “literally”. You could even splash out and release their inner grammar nerd by buying the full set of six mugs. 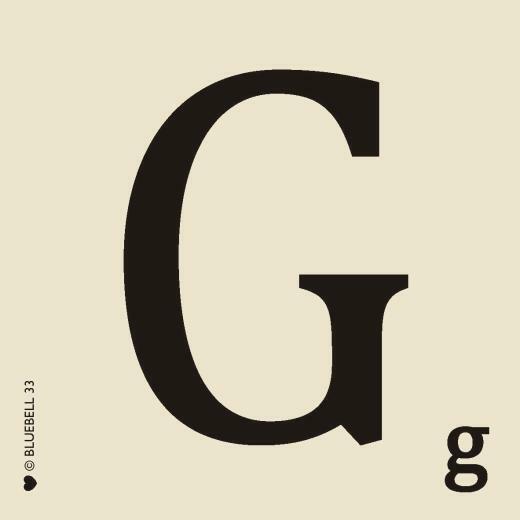 How about a Scrabble-style alphabet coaster to go with the grammar mug? Or any mug for that matter? I was given one of these as a birthday present. It’s now adorning my desk, where it’s catching the coffee stains as well as serving as a useful reminder of my name! Yes, I know what you’re thinking… socks are a somewhat predictable Christmas pressie. But nobody ever said that they have to be plain or boring! 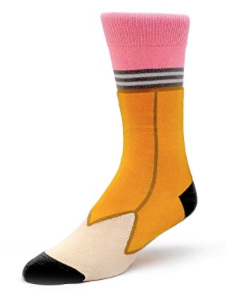 These fun pencil socks are ideal gifts for keeping writers both sharp and warm during the winter months, while they furiously tap or scribble away. After a hard day’s grafting, some writers like to seek solace in a glass (or two) of wine. Not that I’d know of course! 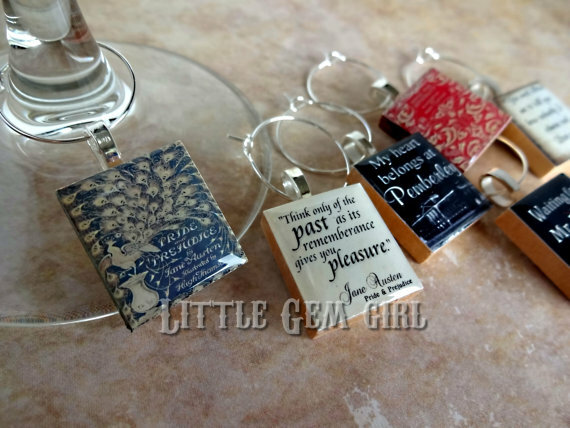 What could therefore be more appropriate than this set of 6 Jane Austen wine glass charms? Writers are renowned for their procrastination skills (ahem, no comment!). 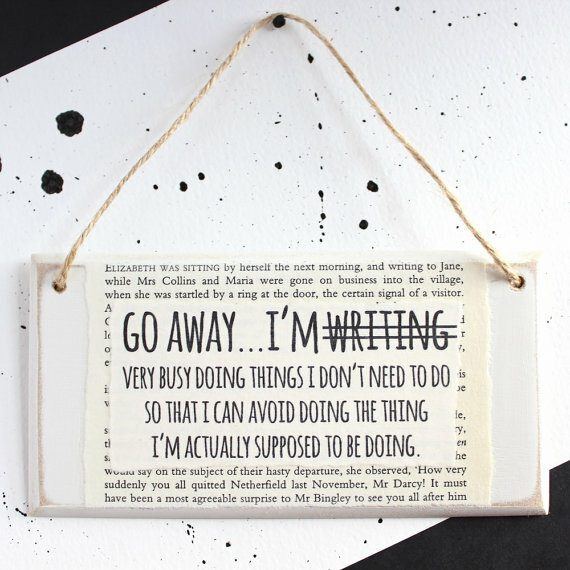 So what better gift idea than a tongue-in-cheek door sign to recognise this state of affairs? And last, but by no means least, what do you buy the writer who has everything? 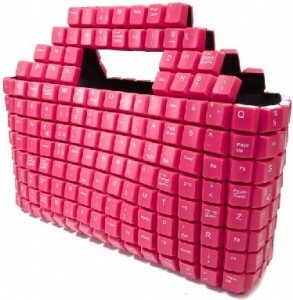 A pink keyboard bag, of course! Hopefully these gift ideas for writers have given you some inspiration. Have you spotted any writing-themed presents that you think are equally cool? Do let me know in the comments as I’m always on the look out for original gift ideas for myself or for fellow wordsmiths. Creative list! I like the variety of options you’ve pulled together. 🙂 You’re right–they’re a bit different from the usual, which is fun. Top marks for the keyboard bag. very cool. Thanks. It’s fab, isn’t it? Glad you liked them! I tried to find things that were a little bit different from the usual. Which one will I be getting?? I especially like the cushion as I never finish anything either!